The United States has been the driving force behind global innovation for a long time. Facebook, Amazon, Netflix and Google, abbreviated as FANG, are amongst the most admired technology companies in the world. On the other side of the Pacific, China is an up and coming force to be reckoned with. Technological giants in the form of Baidu, Alibaba and Tencent (BAT) are taking great strides and catching up fast. We have covered FANG previously. We will now move on to discuss BAT. In my FANG article, I expressed some unease about Netflix being in the alumni along with mighty Facebook, Amazon and Google. In the same vein, Baidu seems rather out of place in the company of Alibaba and Tencent. Using revenue as a measurement of their reach and influence, Baidu’s revenue of CNY 85 billion is about one third that of Alibaba’s CNY 250 billion and Tencent’s CNY 238 billion. That is the biggest indication that Baidu is not quite in the same league. All three companies have been around since the early 2000s, but Alibaba and Tencent have grown and scaled at a much faster pace than Baidu. Baidu is the number one search engine in China, with a 76 percent market share. It is China’s equivalent of Google and Netflix. Comparing across search engines, Baidu is also not in the same league as Google. Not only does Google serve a worldwide audience, Alphabet’s (Google’s parent) revenue is also 9 times larger than Baidu’s. Baidu and Netflix have almost the same amount of revenue though. Many would argue that the Chinese Government has been largely responsible for Baidu’s success. They made numerous Google services unavailable in China, effectively nipping its growth in the bud. 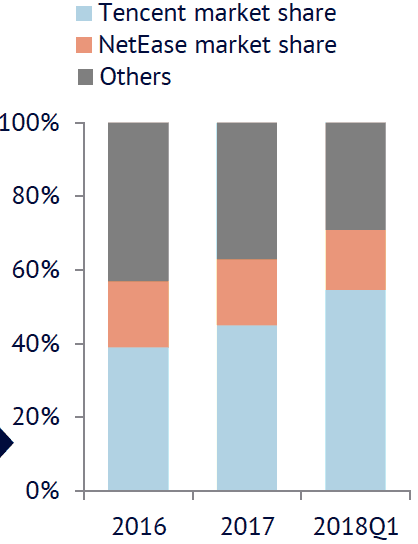 From 36.2% in 2009, Google China’s search market share has dwindled to 1.7% in 2013. Google is now seeking to make a comeback by developing a search engine solely for China and to comply with Chinese censorship laws. This is indicative of the huge market potential of China. If Google China is able to make further inroads this time round, it would definitely give Baidu a run for its money. 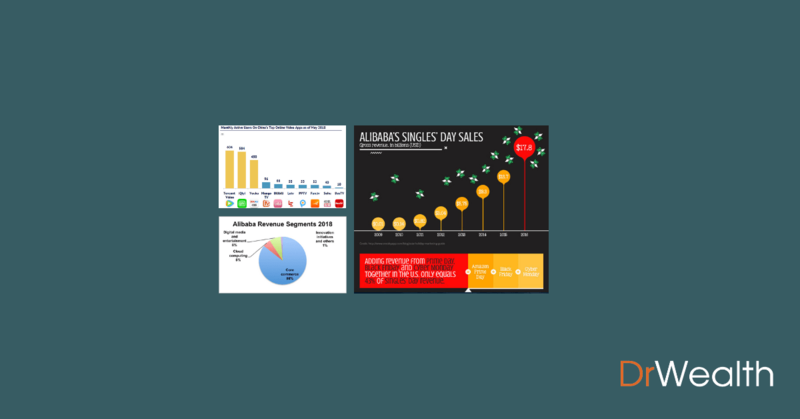 Some market share would be taken away; the only question is – How much? Baidu Core is made up of keyword-based marketing services targeted at and triggered by internet users’ search queries, which mainly include Pay-for-performance advertising services and other online marketing services, artificial intelligence-enabled new business initiatives and internet financial services. iQIYI is an online video platform with a content library that includes licensed movies, television series, cartoons, variety shows, self-produced programs and other programs. 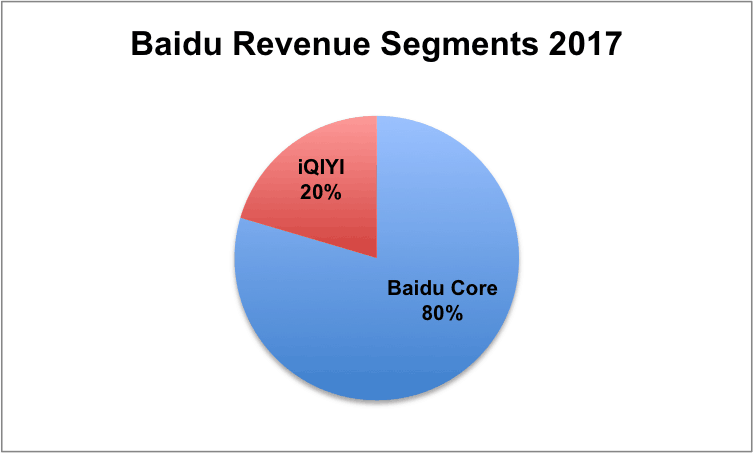 Most of the revenue is contributed by Baidu Core. iQIYI contributed only 20%. iQIYI has reported losses as recently as Dec 2017. Despite that, Baidu has managed to list it on NASDAQ in Mar 2018 for US$18 per share. Baidu raised US$2.25 billion in the process. Despite iQIYI being China’s biggest streaming platform, it still has room to grow. I recently came across an article on the South China Morning Post (SCMP) about a record-breaking TV series on iQIYI – The Story of Yanxi Palace. It was about back-stabbing imperial concubines and the series attracted a cumulative 5.6 billion views in a month after its release. It would be hard, if not impossible to achieve that kind of numbers outside of China. On all accounts, iQIYI has done well to be able to achieve listing status. Baidu would need more of similar iQIYI ventures and to get more businesses through their search engine if they want to remain a recognised tech powerhouse. That said, iQIYI is not the only player in this space. They are not even the biggest. 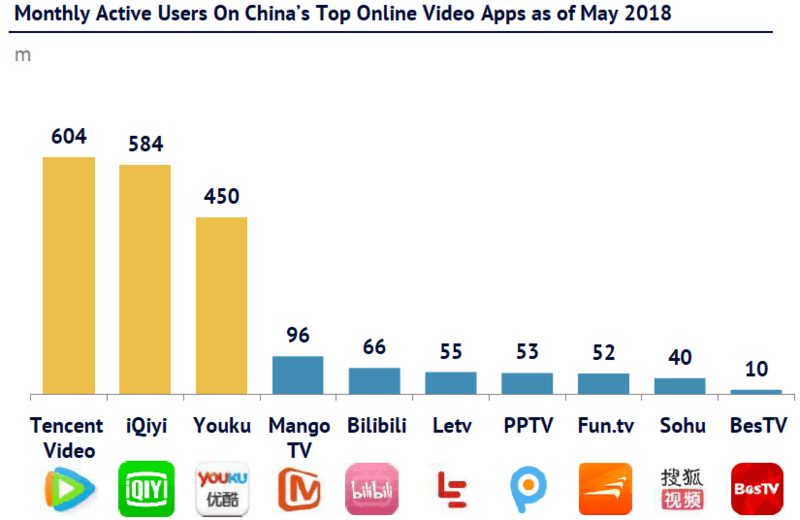 Both Tencent and Alibaba (through the acquired Youku) also have their share of the online video market. Festivals nowadays serve as an excellent ‘excuse’ for businesses to promote their products. Expensive flowers for Valentine’s Day. OSIM chairs for Mother’s Day. You get the idea. Businesses use festivals to get consumers to spend more. In the U.S., there is Black Friday, a day after Thanksgiving where online and physical stores slash prices to push more sales through the doors. As though Black Friday is not enough, retailers even coined “Cyber Monday” to continue selling throughout the weekend. Amazon made $5.03 billion and $6.59 billion during Black Friday and Cyber Monday respectively in 2017. These two days alone accounted for about 7% of Amazon’s 2017 revenue. In China, 11 November of each year (since 1993) is known as Singles’ Day. This serves as a good reason for singles to engage in retail therapy. The logic is extended to couples, who are also encouraged to buy gifts to keep their other half happy. Alibaba’s $17.8 billion worth of sales on Singles’ Day is unrivalled worldwide. 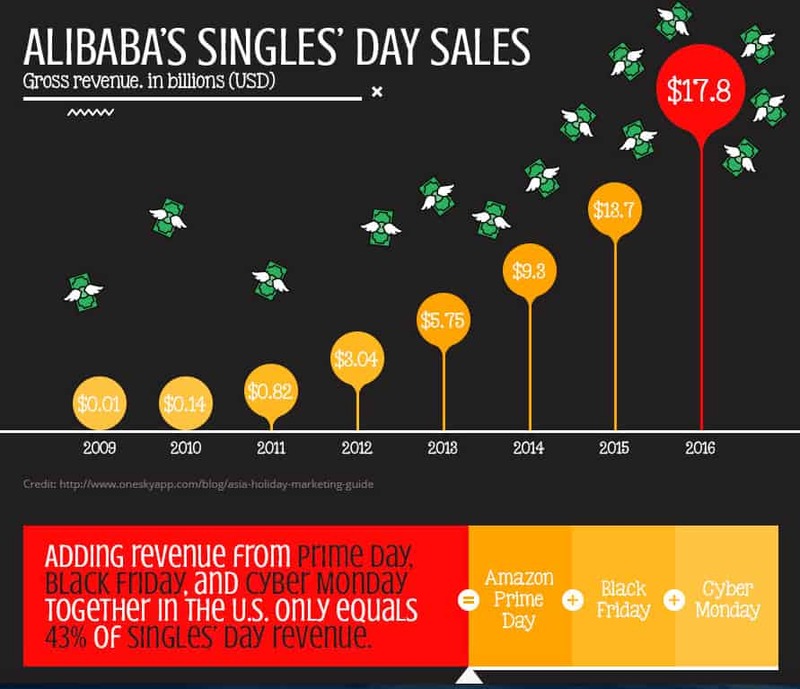 To put things into perspective, Amazon’s Prime Day, Black Friday and Cyber Monday takings altogether can only match up to 43% of Alibaba’s Singles’ Day revenue! In my view, Ant Financial is the most successful Fintech company ever. A subsidiary of Alibaba, the development of Ant Financial to rival the largest financial institutions in the world in such a short time is unbelievable. I have always held the stand that it is very difficult for a fintech startup to grow to become a behemoth. But it is much easier for tech companies like Alibaba and Grab to move into Fintech after having established a large customer base. That was the beginning of Alipay. The rest, like they say, is history. In 2013, Alipay launched Yu’ebao （余额宝）. The latter is an online money market fund that offers an attractive interest rate. I see this as a natural progression. Since consumers are already transacting money online, why not stretch it even further and see if people are willing to deposit their money too? Yu’ebao offered higher interest rates to entice users to deposit their money. The company could afford the higher rates because it did not have to bear the cost of physical bank branches and sales representatives. It was a runaway success. Yu’ebao became the largest money market fund in the world in a short span of four years. As of Dec 2017, Yu’ebao holds US$233 billion worth of assets, which is almost double the next largest money market fund by JPMorgan with US$140 billion. Alipay’s parent company was renamed Ant Financial Group. It was a name more befitting of their diverse financial services. Other than Alipay and Ant Fortune (Yu’ebao and other wealth management services), Ant Financial also owns Zhima Credit (a private social credit rating program), Mybank (microlending to small enterprises) and many other lesser known platforms. Ant Financial provides banking services virtually without the brick-and-mortar branches. Twenty years ago in the 90s, Bill Gates was quoted as saying “Banking is necessary, banks are not”. Twenty years later, Ant Financial more than validated Bill Gates’ foresight and astuteness. It has been long rumoured that Ant Financial would be spun off from Alibaba for an IPO. However, a recent round of successful fund raising from private investors has put that to rest. In June, Ant Financial raised $14 billion from investors worldwide, with both GIC and Temasek both having purchased a stake. With such strong demand from funds and institutions, it would be a while before they would need to consider raising funds via an IPO. With a $150 billion valuation from this round of fundraising, Ant Financial now has a greater market capitalisation than Goldman Sachs. We are all well aware that ecommerce has been growing by leaps and bounds and in the process killing brick-and-mortar retail. The weird twist in the story is that now, ecommerce giants like Amazon and Alibaba are moving back into physical stores! Alibaba recently launched a new supermarket chain known as Hema Xiansheng (盒马鲜生）as part of their “New Retail” strategy. The goal is to make online and physical shopping seamless to the customers, redefining the way stores are run. You can find out more in this short video of Hema Xiansheng where a customer shops in the store with a mobile app. Information and recommendations of products can be found on the phone. The customer checks out with, of course, Alipay. The stores also double up as a restaurant as well as a grocery delivery centre. According to The Economist, Alibaba has grown so successful that its market capitalisation is now equivalent to 700 of the biggest industrial firms in China. They have even created Alizila, a division just to produce news and information about Alibaba’s development. Even the Public Relations department within the company carries its own brand. Talk about redefining industries! Where Does Alibaba Make All That Money From? Enough with all the Alibaba stories. While they sound very impressive, it is the numbers that count. 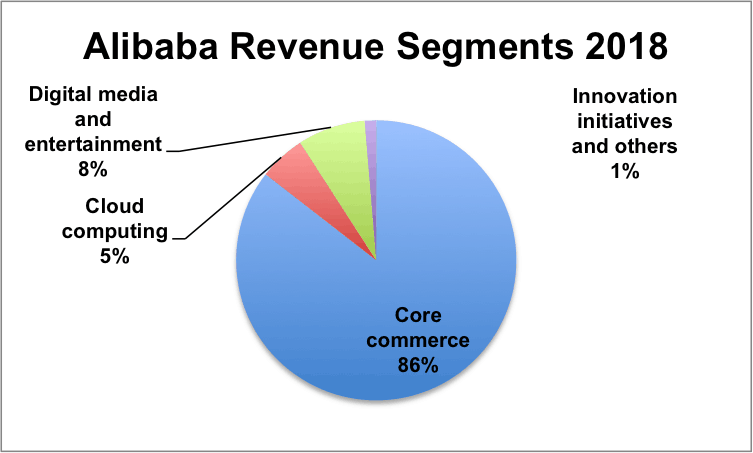 You will notice that most of the money is derived from ecommerce, which accounts for 86% of Alibaba’s revenue. Ant Financial is part of the “Innovation initiatives and others” segment and it only contributed part of the RMB 3.2 billion (less than 1 percent of Alibaba’s revenue). This is because Jack Ma owns the majority of Ant Financial personally. This is set to change though. As stated in their 2018 Annual Report, Alibaba is in the midst of purchasing 33% of Ant Financial. One of the concerns about Chinese tech firms is the ownership structure known as Variable Interest Entities (VIEs). This arose because of China’s strict rules to prevent sensitive internet assets being owned by foreigners. Founders like Jack Ma parked these assets under their names while the main listed company such as Alibaba would not have sufficient stakes in these entities. This is rather disadvantageous to the shareholders of the listed companies as the success of some of the VIEs may not translate to their gains. Core commerce. The core commerce segment comprises of platforms operating in retail and wholesale commerce in China, retail and wholesale commerce — cross border and global, logistics services and others. Cloud computing. The cloud computing segment comprises of Alibaba Cloud, which offers a complete suite of cloud services, including elastic computing, database, storage, network virtualization services, large scale computing, security, management and application services, big data analytics, a machine learning platform, IoT and other service offerings for enterprises of different sizes across various industries. Digital media and entertainment. The digital media and entertainment businesses leverage our deep data insights to serve the broader interests of the consumer through two key distribution platforms Youku and UC Browser, and through diverse content platforms that provide movies, TV drama series, online dramas, variety shows, games, literature and music. Innovation initiatives and others. The innovation initiatives and others segment include businesses such as AutoNavi, DingTalk, Tmall Genie and others. It also includes Ant Financial. Facebook and Whatsapp are not commonly used in China. WeChat is the King. WeChat has evolved into a super-app. One can pay for things, send and receive money, shop online, call a cab, chat, play games and more. With just Wechat alone, one can be a fully functional member of the society! 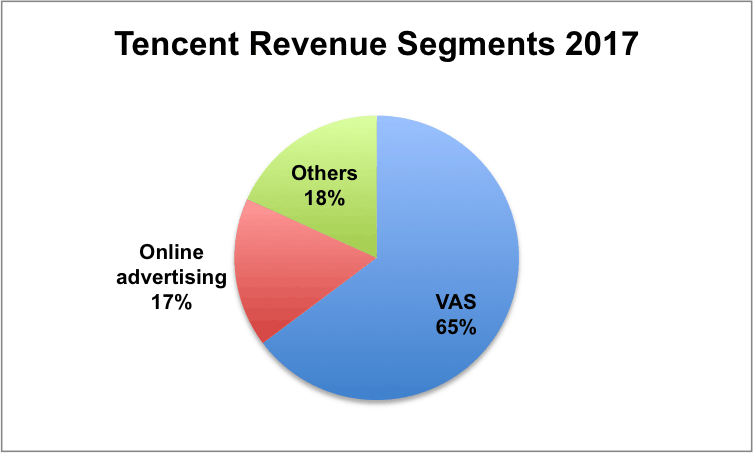 Tencent has three major revenue segments, and most of the money derives from Value Added Services (VAS), or simply, their games. Value Added Services. Revenues from VAS are derived principally from the provision of online games, community value-added services and applications across various online platforms. Online Advertising. Online advertising revenues mainly comprise revenues derived from media advertisements and from social and others advertisements, depending on the placement of advertising properties and inventories. Others primarily comprise payment-related services for individual and corporate users, cloud services and other services. Tencent has conquered half the market in China. Their share has been increasing over the years. It is clearly a winner-takes-all market. It is not difficult to make money from mobile gaming. Games are usually free to download and they are designed to be addictive once a player gets started. However, in order to make some progress in the game, the player is often required to pay for upgrades. Players who are hooked are more than willing to buy, as shown in the rising revenues of Tencent. If you are still not convinced, look around you the next time you are on the train or bus. Chances are a good number of commuters will be engaged in some form of mobile gaming. Games have evolved from Playstation and PC days. Mobile battle royal games such as PlayerUnknown’s Battlegrounds are very popular now. Esports competitions are followed by over 200 million Chinese in a year! Tencent happens to own the top two esports streaming companies in China, Huya and Douyu. 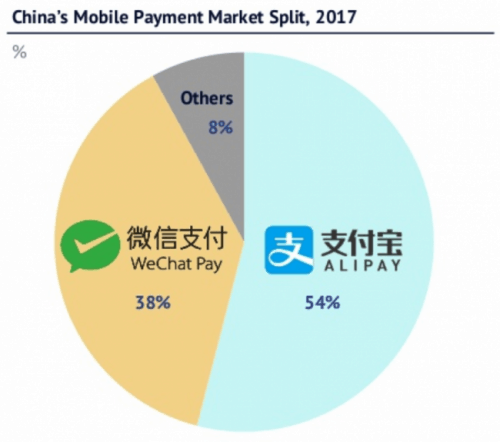 Alipay and WeChat Pay have jointly captured 92% of the mobile payment market. I want to experience the much talked about cashless system in China for myself. The international version of WeChat does not support the WeChat Pay function, and the only way to get it activated is to physically visit China to download the local edition. With that in mind, I made a trip to Shenzhen with some friends in July this year. The first thing we did after making the border crossing from Hong Kong was to purchase a Chinese SIM card. Like most other countries, our passport details were required to register the number and activate it. Unlike other countries though, we were required to hold the SIM card and have a picture taken with it. In fact, we were made to take two photos, one with the SIM card and another of just our headshot. The Chinese Government is now able to identify us using surveillance cameras dotted everywhere in the country. There would be nowhere to hide. We popped the SIM cards into our phones. Because Google is not allowed in China, we are unable to download apps through the Google Play Store. I then learned that almost every Chinese tech company has her own ‘app store’. We downloaded the local version of WeChat via Tencent’s YingYongBao, and we were excited to see the Wallet in our profiles! But we soon ran into problems as we could not verify our identities to unlock the Wallet function. We had to get someone who was on WeChat pay for at least 6 months and who has not verified more than 3 persons in one year. This is a stringent requirement, and probably one of many to tighten the mobile payment ecosystem. Even after we got our account verified, we were unable to add Singapore-based credit cards. We knew that beforehand and we had planned to open bank accounts in Shenzhen so that we can get China-based cards. Frustratingly, each bank required different documents for us to open a bank account. One of them requested for a proof of temporary stay and directed us to obtain it from the police station. When we arrived, the policeman informed us that there are no more physical forms to fill up. We were surprised that we could use WeChat to register for the temporary stay permit. Even the police department has gone high tech. The next thing that happened blew our minds even further. We could not key in the address of our apartment. The only way to input our address was to scan a QR code that is located outside our unit. Effectively, every apartment in Shenzhen is digitised. China has come a long way indeed. Unfortunately, we did not manage to get our bank accounts started by the end of the trip. Despite being somewhat inconvenienced, we still managed to get by without Alipay or WeChat Pay. Shops, cabs and train stations still accept cash grudgingly as a mode of payment. We also discovered that Union Pay, not Visa or Mastercard, is the preferred credit payment processor for the Chinese. A few weeks after returning from Shenzhen, I tried to input my Singapore-based credit card into WeChat Pay. Miraculously, it worked. The app is being upgraded rapidly, and one can only be amazed by the speed of evolution. I was still unable to top up the Wallet using the Singapore-based cards, but I could already receive Hong Baos, and my Wallet is currently funded. I am looking forward to using it on my next trip to China. I had wanted to share my first-hand experience with China and its technological advancements in recent years. The irony is, the information would probably have been outdated by the time you are reading this. While I applaud the level of technology in Chinese cities today, there is also a flip side to it. Technology is being used to increase surveillance of its citizens. For example, there is this creepy social credit system in China and Tencent is one of the organisations that track its users’ behaviour. Bad behaviour may get you banned from taking trains and good behaviour could see you accrue discounts on utility bills. If you are interested to find out more about what the social credit system is all about, the Netflix series Black Mirror (Season 3 Episode 1 ‘Nosedive’) is a good place to start. Finally, while I used to be indifferent to the language, I now appreciate the fact that I can read and speak Mandarin. China’s dominance will only strengthen in the decades to come and understanding the language will be a huge advantage. Baidu, Alibaba, Tencent – Which One Would Be The Best Stock To Own? We will apply the Gross Profitability Asset Dividend (GPAD) strategy and the Profitability criteria on BAT since they are asset light tech companies. The numbers indicate that Alibaba and Tencent are better choices with much higher Gross Profitability. However, I would have expected their Gross Profitability to be much higher given that they do not have many assets. There are two reasons for this. First, Alibaba and Tencent have been acquiring companies as they try to claim market share in many areas. Many of these acquisitions are likely to have been made above book value. Consequently, goodwill is registered as part of the assets. This inflates the asset base. Second, even though they are ‘asset-light’, they have begun investing in physical stores. Hence, the asset base is likely to grow over time. This will cause Gross Profitability to decline if the Gross Profits do not keep pace with asset growth. It is important to note that Gross Profitability is a quality metric and not a valuation metric. Gross Profitability only tells us that Alibaba and Tencent are of better quality than Baidu. It does not tell us whether their current share prices are at an attractive level for us to invest. Tech companies are very difficult to value as accounting measures have not evolved enough to accurately capture the value of technology or software. For example, tech companies rely on talented programmers to build world-dominating software. Programmers though are not reflected in the balance sheet as assets. On the contrary, they are reflected as expenses in the income statement. Secondly, successful programmes are likely to generate more revenue than the value reflected as intangible assets in the balance sheet. With these ambiguities, we would not even attempt a valuation exercise. We do know, however, which are the better tech stocks in this case. Chinese technology is beginning to rival the US in many areas. The country has produced top-tier tech companies in Baidu, Alibaba and Tencent. China’s large and protected domestic market has fuelled the adoption of the products and services by BAT. It is likely that BAT will continue to break new grounds. Their technology will continue to amaze us. We will soon live in a world that we cannot even imagine just some years ago. BAT has broken records in sales, assets under management, viewerships and many other benchmarks. The bar will continue to be raised going forward. 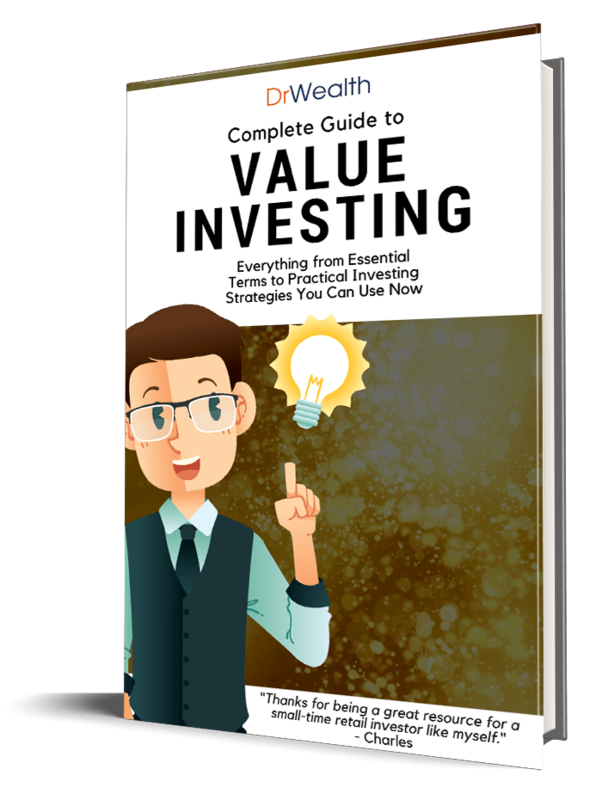 The increasingly important role technology and tech companies play in today’s world mean that investors can no longer turn a blind eye to them. Unfortunately, accounting and valuation models remain backwards and they are unable to value tech companies properly. While we lack a good way to determine their value, we could still separate the higher quality ones (such as Alibaba and Tencent) from the lower quality ones (such as Baidu). Fortune had a good piece on the rivalry between Alibaba and Tencent. Are Local Startups & SMEs Focusing Too Much On Government Grants and External Funding? You did not mention the recent gigantic drop in TENCENT. May I know your thoughts on that? Also, do you think an investment in ETF KWEB a good way to gain exposure to BAT? I won’t be able to give specific advice if you should buy something. The general consensus of Tencent’s decline is that the investors’ earnings expectations were not met. But we will never know the real reason. Some may even blame it on the trade wars or the weak Asian markets. My view is that stocks in will have gigantic drops due to the company developments and investors’ expectations from time to time. If one is not comfortable better don’t buy stocks and manage it directly because the volatility will cause one to make a lot of mistakes. This includes ETFs too because stock market can crash as well. I consider all the three companies good. But if I should invest, I will not throw all my money in any of the company. I will rather spread my investment with a positive bias towards the company that is more innovative, having passed all my acid test for investing in stocks.